Back in January, when new Republican House Speaker Tim Moore was taking the reins of his side of the General Assembly, he demoted Rep. Justin Burr (R-Albemarle) from the powerful Appropriations Committee. 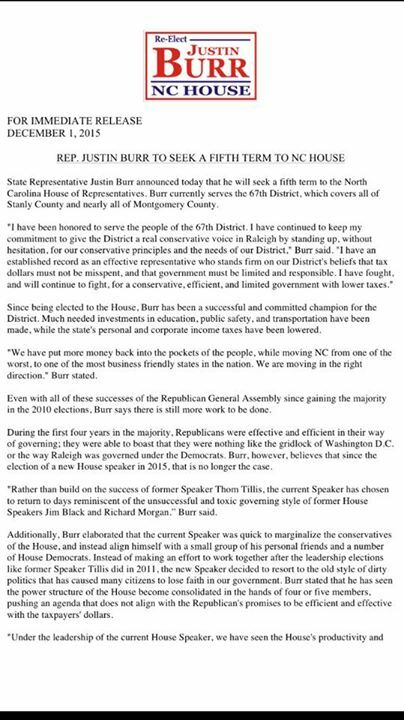 We're sure there's more to the story, but now Rep. Burr has slapped back at his boss in the most public way ... right smack in his "filing statement" for reelection. Check out the last couple of paragraphs on the page below (sorry -- the 2nd page of the letter was not posted to Rep. Burr's Facebook page, just the 1st page). Wow. Comparing the sitting Speaker of the House to the crooked and jailed Jim Black, the Democrat that Raleigh Republicans love to hate, is pure acid.